What is the YEAR Function? The YEAR function is a Date/Time functionFunctionsList of the most important Excel functions for financial analysts. This cheat sheet covers 100s of functions that are critical to know as an Excel analyst that is used for calculating the year number from a given date. The function will return an integer that is a four-digit year corresponding to a specified date. For example, if we use this function on a date such as 12/12/2017, it will return 2017. Using dates in financial modelingWhat is Financial ModelingFinancial modeling is performed in Excel to forecast a company's financial performance. Overview of what is financial modeling, how & why to build a model. A 3 statement model links income statement, balance sheet, and cash flow statement. More advanced types of financial models are built for valuation, plannnig, and is very common and the YEAR function helps extract a year number from a date into a cell. 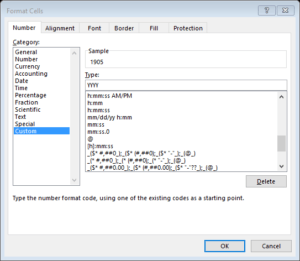 The function can also be used to extract and feed a year value into another formula such as the DATE function. The serial_number argument is required. It is the date of the year that we wish to find. Dates should be entered either by using the DATE function or as results of other formulas or functions. Problems can occur if dates are entered as text. 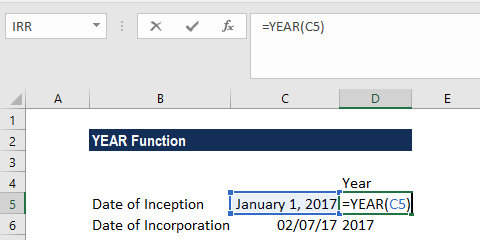 How to use the YEAR Function in Excel? Let’s assume we shared an Excel file with several users. We want to ensure that a user enters only dates in a certain year. In such a scenario, we can use data validation with a custom formula based on the YEAR function. Data validation rules will be triggered when any user tries to add or change the cell value. When the years match, the expression returns TRUE and the validation succeeds. If the years don’t match, or if the YEAR function is not able to extract a year, the validation will fail. 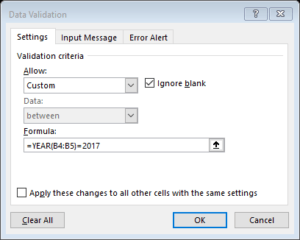 The custom validation formula will simply check the year of any date against a hard-coded year value using the YEAR function and return an error if the year is not entered. If we want that a user enters only a date in the current year then the formula to be used is =YEAR(C5)=YEAR(TODAY()). The TODAY function will return the current date on an ongoing basis, so the formula returns TRUE only when a date is in the current year. Date values returned from other Excel formulas. If we try to input dates as text, then there is a risk that Excel may misinterpret them, due to the different date systems or date interpretation settings on your computer. 2. The value returned by the YEAR function will be Gregorian values regardless of the display format for the supplied date value. 3. The YEAR function perfectly understands dates in all possible formats. yy – to display 2-digit years, as 00-99.
yyyy – to display 4-digit years, as 1900-9999.